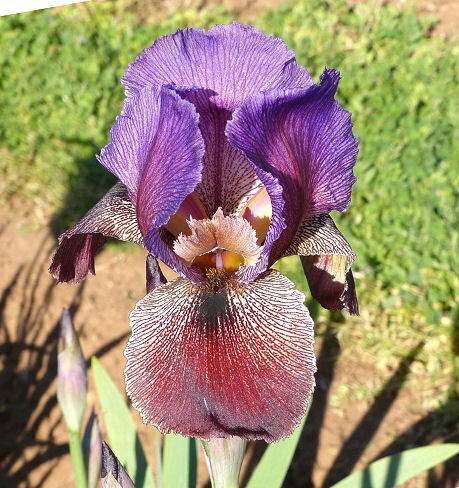 'Pharaoh's Host' (Walter Moores, R. 2011) Seedling 98-2-A. AB (OGB), 24-26 (6162 cm), Early bloom. Standards dark lavender blending to maroon at midrib and base, darker lavender veins; style arms blended light brown, serrated; Falls red brown to maroon, cream area veined lighter maroon at hafts and halfway down petal, cream wire edge, black signal, serrated; beards lighter bronze-brown base, hairs tipped darker bronze-brown; stray hairs outside of beard. 'Zerzura' X 'Tel Aviv'. Moores 2012.